From what I understand, Group Therapy started out mainly as an event space for birthday parties, media launches and corporate workshops, but the cafe business has slowly grown with the help of word-of-mouth recommendations. The menu changes from time to time, but you can expect comfort food like salad ($15), soup ($11), sandwiches ($14), eggs ($11-15) and desserts ($4.5-8.5). When we were there on a Saturday afternoon, we ordered from their all day breakfast menu to share. The Poached Eggs ($15) that we had was gorgeous. Stacked on top of an extremely thick and fluffy toast, the poached eggs with salmon came with a generous helping of the hollandaise sauce. It was fantastic! I was slightly disappointed when I found out that they only serve pancakes (from a special brunch menu) on Sunday. But that feeling was gone with the arrival of the waffles. Weekends are made of Belgian style waffle ($8.5) with maple syrup and butter. 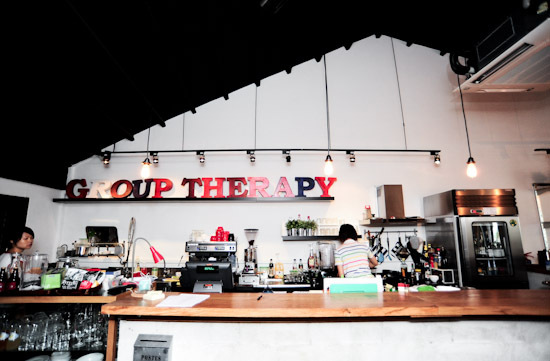 Group Therapy Cafe at Duxton road does not serve out-of-this-world good food; the menu is simple and unpretentious. They have a very comfortable and relaxing space, and I love the fact that not many people know about them YET. Thanks for sharing! Many people will know about it now! Wrecked my event plans with stupid reasoning and lack of communication. Lack of business ethics in dealing with event organiser. Subsequent shift of blame upon retrieval of cheque deposit that was personally brought down and given in good faith. Overall, poor business. No point trying to hold your event there, when they are willing to cancel it even once money changed hands.